The eagle-eyed amongst you may have noticed that beneath ‘Welcome’ on this blog I mention ‘Great Food & Drink’ amongst my interests. Subsequently, over the coming months you may begin to see the occasional restaurant review on Social Web Thing, especially if there is a social business/media element to the eatery. There are several reasons for this move; my reluctance/laziness to create a food blog elsewhere, simply wishing to broaden the topics I write about and more selfishly, because I want to. But fundamentally I view writing about social business/media and food and drink as not only matching up some of my interests, but the merging of passions. Right then. Introduction over. Lets get reviewing. Whilst I was back in London over the festive period I had the pleasure of visiting Meat Liquor. Although, lots of foodie bloggers have well and truly beaten me to the punch to pen a review, there are still many who have yet to hear about Yianni Papoutsis’ latest venture. For those unfamiliar with Yianni’s rise to fame, his story is one of social media stardom, one that has seen him go from selling burgers out of theMeat Wagon to having a fully fledged restaurant in one of the most sought-after west end postcodes. Its been quite a journey and a year ago I blogged about the mythical #MEATEASY operation happening above a pub in New Cross Gate, as well as finally getting my hands on an awesome Meat Wagon burger in the Mahiki tent during Henley Regatta. Meat Wagon became something of an underground movement – and whilst the secrecy of the Meat Wagon may have diminished, I’m pleased to report the taste and quality has not. That’s the history out of the way. Now lets get back to that review. It was towards the tail end of 2011 that I decided to treat myself to another brilliant burger and apart from great grub, we turned up at Meat Liquor(just off Oxford Street) not knowing what to expect. As we entered the dimly lit premises, we were hit by the waft of delicious smelling food. Once seated we had the opportunity to look round at the decor and absorb the atmosphere. With a name like Meat Liquor the interior of the restaurant was always going to be bold, brash and in your face – and we weren’t disappointed. In fact we were met with loud music, dark colours and striking images adorning the walls. Whilst the environment was good fun, it was the food we had come for. I eagerly ordered the Chilli Cheese Fries as a starter, followed by the infamous Double Bubble with slaw and onions rings, all washed down with a couple of bottles of highly recommended Meantime lager. The starter came quickly enough and was a generous portion of fries smothered with chilli beef, cheese, onions, jalapenos and mustard. It was delicious. The starter tickled the taste buds and was a perfect re-introduction to Meat Liquor. However, it was the exquisite burger which stole the show.The Double Bubble consisting of two beef patties, cheese, pickles, white onions, TK and mustard was packed full of flavour. Messy, juicy, tasty. The Double Bubble had it all. Served medium-rare, the freshly made burger tasted absolutely fantastic and was perfectly matched to the beer. If I was forced to be picky, I would say the slaw wasn’t to my taste, but that’s more of a personal, rather than quality issue. French philosopher Voltaire was correct when said “Nothing would be more tiresome than eating and drinking if God had not made them a pleasure as well as a necessity.” and Meat Liquor is definitely the place to eat some pleasurable, tasty and unashamedly unhealthy food.To sum Meat Liquor up in three words I would say; dark, dingy, delicious. You should pay a visit. Fantastic burgers are in its DNA – and after all, everyone loves a great burger. Great write-up Ben. I’ve been meaning to check this place out for a few weeks now and your review has definitely inspired me to do it sooner rather than later! Hey Rax, thanks for commenting. 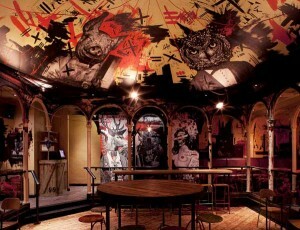 It’s definitely worth paying a visit to Meat Liquor – you won’t be disappointed, but make sure you get there early!